Rain Dance Necklace handmade by Santa Fe artist Michelle Tapia. Rain Dance Necklace handmade by Santa Fe artist Michelle Tapia. This incredible piece of wearable art features a large hand carved tagua nut depicting a rain dance with a beautiful piece of varisite and flowers with small purple amethyst stones as the center. The rain dance pendant hangs from a piece of sun stone surrounded by a sun made from sterling silver and 14 karat gold accents. 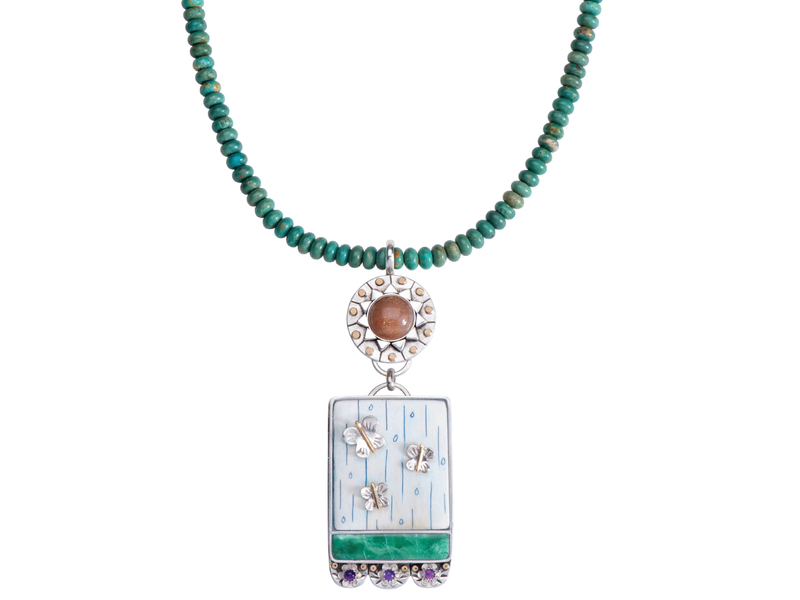 The hand carved beads are varisite and measure 16″ inches long with an additional adjustable chain. Scrimshaw is a technique employed by sailors in the 1800s using whale teeth and squid ink to create beautiful pieces of art. Not only was this a way to kill time on their long voyages, but gave the sailors something to barter at port for items they needed. Scrimshaw literally means “to waste time”. 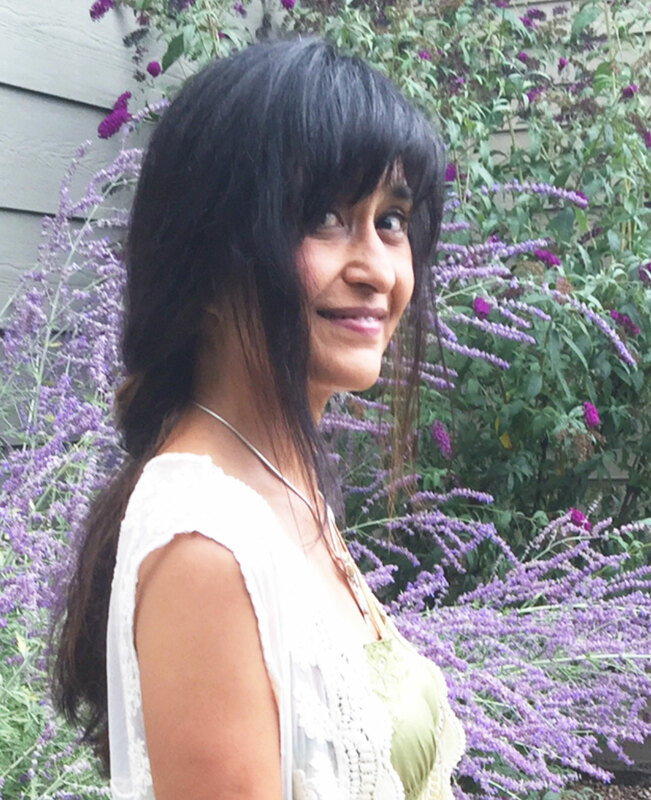 Michelle Tapia uses fossilized walrus tusk and tagua nut, which is the palm seed from Ecuador in her jewelry designs. The walrus tusk is dug up off the coast of St. Lawrence Island, Alaska and can be up to 20,000 years old. All the walrus died of natural causes. The color desponds on what minerals were present where the tusks were found. The Inuit also use this technique in their art. Tapia never uses elephant ivory or fresh walrus tusk. Care must be taken so that the ink does not fade on her pieces. She recommends that you wipe them with a dry cloth and avoid getting them wet. Over time, especially her rings may slightly fade. In these cases, she will re-ink the pieces at no charge. 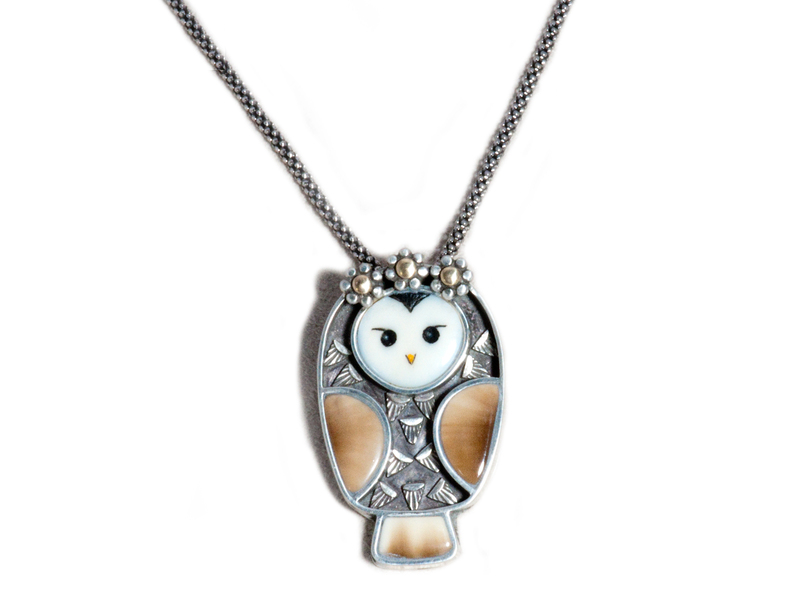 Michelle Tapia is an award-winning jeweler and scrimshaw artist from Los Alamos, New Mexico. Scrimshaw is a technique developed by sailors in the 1800’s using whale teeth and squid ink to create beautiful pieces of art. Tapia uses fossilized walrus tusk and tagua nut, a palm seed from Ecuador. The walrus tusk is dug up off St. Lawrence Island in Alaska and is approximately 20,000 years old. All of the walrus died of natural causes. Tapia never uses elephant ivory or fresh walrus tusk. The tusks she uses are completely legal. 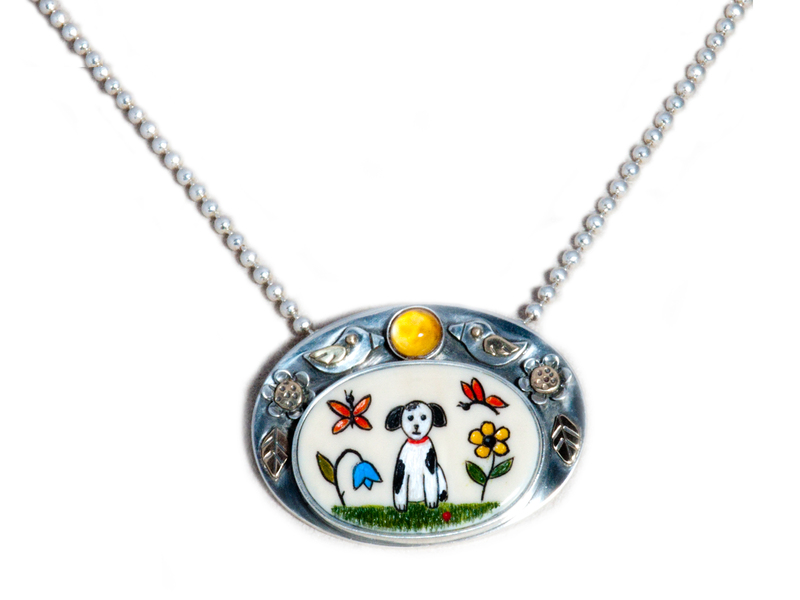 Inspired by animals, nature, love, and beauty, she makes each of her designs by hand. Note: Care must be taken so that the ink does not fade. Wipe with a dry cloth and avoid getting jewelry wet.